Russia's architectural wonders. Historic travel destinations in Russia. What sites one would first think about if asked about Russian architecture? It is for sure Saint Basil cathedral in the Red Square in Moscow, which is considered to be the most beautiful cathedral in Russia and one of Europe’s most beautiful holy places; constructivist monuments and buildings of the Soviet epoch; the palace and park of Peterhof, called "the Russian Versailles"; the "Seven Sisters" of Moscow famous Stalin's sky scrapers; khrushchevki apartment blocks, that became a home for millions Soviet people in hard after-the-war years; magnificent wooden ensembles of town fortresses and many more. Russia's architectural richness reflects the country's long and eventful history, cultural, ethnic, and religious diversity of its peoples. We would like to introduce some less promoted spots that might have missed wide international recognition, but yet remain the real wonders of Russian architecture. Kizhi is an island near the lake Onega in the Republic of Karelia. Architecture ensemble situated in Kizhi village is one of popular tourist attraction. Settlements and churches on the island were known from at least the 15th century. Along with architectural monuments kept intact since the moment of their creation, some were brought from other regions and restored on the museum territory in 1950s. Nowadays, the entire island and the nearby area form a national open-air museum with more than 80 historical wooden structures. The most famous is the Kizhi Pogost, which is a UNESCO World Heritage site. Among the moved architecture objects are the Church of the Resurrection of Lazarus from Murom Monastery, which is regarded as the oldest remaining wooden church in Russia (second half of 14 century); Chapel of the Archangel Michael, several bell-towers, more than 20 peasant houses, mills, barns and saunas. The unique feature of Kizhi churches is that they were built of logs that assembled without nails, using interlocking corner joinery. Founded in 1397 Kirillo-Belozersky Monastery used to be the largest and most important monastery of Northern Russia. It stands on the banks of the Sheksna River in Vologda Region in northern Russia and is one of best preserved medieval Abbeys in Russia. The monastery was dedicated to the Feast of the Dormition of the Theotokos. Initially wooden churches and walls were replaced over succeeding centuries by impressive stone and masonry structures. The vast walled area of the monastery comprises two separate priories with eleven churches, most of them dating to the 16th century. The complex contains eleven churches with the largest cluster surrounding the Assumption Cathedral built in 1497. The smaller Ivanovsky priory is dedicated to St. John the Precursor, the patron saint of Ivan the Terrible. The present day fortress walls are 732 meters long and 7 meters thick, were constructed in 1654-80. They incorporate parts of the earlier citadel, which helped to withstand the Polish siege in 1612. There are a number of towers, each named and distinctive. The most remarkable are the Chasuble, the Tent-like, the Vologda, and the Smithy towers. The monastery was secularized and turned into museum after the Russian October Revolution. The larger part of the monastery is still administrated as the Kirillo-Belozersky Museum of History, Art, and Architecture. It displays an impressive collection of icons, furniture and ecclesiastical robes. In 1998 monks were readmitted to a portion of the complex. Suzdal is an ancient Russian town in the Vladimir Region especially famous for being rich in architectural monuments. It is often referred to as a living museum of Russian history. The city forms part of the Golden Ring. Vladimir-Suzdal Museum-Reserve includes 56 architectural monuments in Vladimir, Suzdal, Gus-Khrustalny, Bogolubovo settlement and village Kideksha. With almost a millennium history modern Suzdal is featuring many fine examples of old Russian architecture — most of them churches and monasteries. The Suzdal Kremlin is most significant. It occupies the oldest part of the city and is an ancient core of Suzdal. Like other Russian Kremlins, it was originally a fortress or citadel and was the religious and administrative center of the city. It is most notably the site of the Cathedral of the Nativity. Together with several structures in the neighboring city of Vladimir, it was named a UNESCO World Heritage Site in 1992. Other notable historical monuments of Suzdal are: Convent of Intercession, The Saint Alexander Convent, St John the Baptist Church, Wooden Church of Saint Nicholas, St. Euthymius Monastery, Transfiguration Cathedral, The Resurrection Cathedral, The Holy Gate, of Rizopolozhensky Convent. Over 57 meters tower in the town of Nevyansk in Sverdlovsk Oblast, Russia was built in the 18th century. The construction was funded by the manufacturer Akinfiy Demidov (son of the rich Russian industrialist Nikita Demidov). Historians are still debating about the exact purpose of the Nevyansk Tower. Some say that Demidov used it as a "bank safe", others believe it was either a watchtower, or a belltower, or a prison, or even a laboratory for conducting chemical experiments and producing counterfeit money. Some historians think that the tower was supposed to embody the might of the Demidov family and serve as some sort of an architectural symbol of their dynasty. The tower itself has an inclination 2.20 m in its top part at the moment. The purpose of the inclination is not known exactly. There is a version that the tower was purposely built inclined. The restorers however object it and make the drifting grounds responsible for the inclination. The creator of the tower is unknown, however it was found out that he used some of the most advanced technologies available at that time, like metal carcass for the tower’s tented roof, metallic lightning rod assembled to the top of the roof and even reinforced concrete (for the 1st time in history). All Russian Exhibition Centre - formerly known as VDNKh - is a public park and general-purpose trade show in Moscow, Russia. Opened in 1939 as the All-Union Agricultural Exhibition (VSKhV), it had 82 pavilions with the exhibition area of 700,000 square metres by 1989. Each pavilion was designed initially to demonstrate economic achievements of Soviet republics, and thereafter they were grouped by industry or branch of agriculture: Engineering Pavilion (1954), the Space Pavilion (1966), the Atomic Energy Pavilion (1954), the People's Education Pavilion (1954), the Radio-electronics Pavilion (1958), the Soviet Culture Pavilion. The huge exhibition complex is a monument to the pomp of Stalinist architecture. 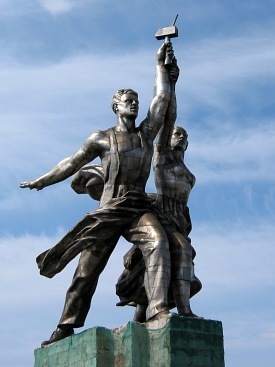 The most memorable feature of the exhibition site was the statue Worker and Kolkhoz Woman (Rabochiy i Kolkhoznitsa), featuring the gigantic figures of a man and woman holding together the famous "hammer and sickle". The sculpture was created by Vera Mukhina and was 25 in height. Another "trade mark" of VDNKh is a golden fountain with sixteen female figures representing sixteen Soviet Republics. Nowadays the VVTs is used for commercial exhibitions and shows. It includes an agricultural fair, a trade expo, a shopping centre, a part street market as well as amusements and a vast park area. The Ipatiev Monastery is a male monastery, situated on the bank of Kostroma River. It was founded around 1330. Most of the monastery buildings date from the 16th and 17th centuries. According to the chronicles the stone walls were 1.5 meters thick and 6 towers. The Trinity Cathedral is most significant church of the complex and is famous for its elaborately painted interior. The history of Ipatiev monastery is tightly connected with the Romanov family who patronized the monastery and generally treated it as the family relic. After the October Revolution in 1917 the Ipatiev Monastery was disbanded. It has been a part of the historical and architectural preservation. Novgorod Kremlin is a prominent monument ancient Russian architecture and most and famous structure of Veliky Novgorod. The kremlin stands on the left bank of the Volkhov River. In the Middle Ages it was called "Detinets". Emerged from the wooden fortifications of the 11th century, it was rebuilt in stone in 14th century. The current fortress was built between 1484 and 1490 by Muscovite builders in the wake of Grand Prince Ivan III's conquest of the city in 1478 It is a large oval 545 meters long and 240 meter wide with nine surviving towers (three additional towers have not survived). The towers had the loop holes on both sides. It has an interesting peculiarity. Built on the swampy area, the Kremlin did not have solid foundation. The walls were constructed on the soil footing with the clay outside. During the seasonal flood the footing absorbs the water and the walls rise several centimeters. There is a drainage system under the Kremlin that has been operating for 500 years already. The main buildings in the Detinets are the Cathedral of Holy Wisdom, Novgorod Museum and the Novgorod Regional Library.